Drop everything, if you're a first-timer parkour practitioner then read this detailed and informative article I stumbled upon on Nerd Fitness, written by guest poster Dakao. It captured everything from the philosophy of parkour to history, to techniques for beginners. 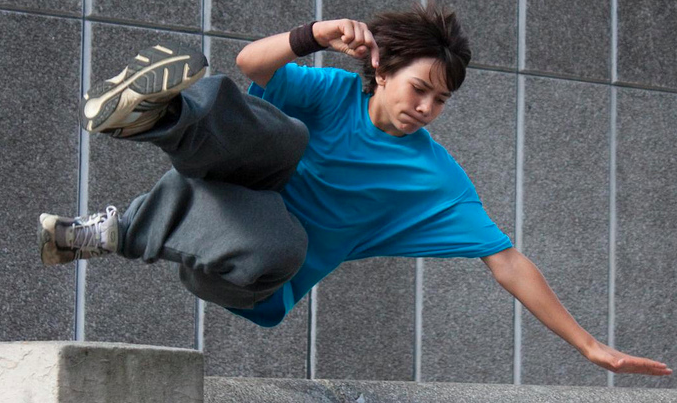 Train naturally: parkour is a stellar poster child for natural movement training. Train with conviction and intelligence: parkour’s emphasis on awareness of your environment and circumstances, as well as performance under pressure, requires as much of these qualities as you can muster, then challenges you to dig deep down and find even more. Train for fun: the playful and spontaneous nature of parkour encourages creativity in a way that I can only liken to improvisational jazz and dancing. Parkour is natural, effective movement. That’s it. In French, we use the term passement for overcoming any obstacle. You pass or traverse a barrier in whatever way suits you and the moment; there’s no one prescribed method for anything. Parkour is a lens of efficiency applied to every aspect of your movement through life. At its broadest definition, it implies a low-impact and considerate attitude towards bosses, co-workers, family, friends, driving, consumer purchases, and the environment (natural or manmade). What is the least effort and stuff you need in order to live the most meaningful and happy life you can make for yourself? As with the Nerd Fitness Rebellion, it is an exuberant and responsible celebration of life. Flips, tricks, aerial acrobatics, etc. These movements can be used to traverse certain obstacles more rapidly or aggressively, but their use in parkour is ultimately dictated by need. Will your zombie pursuers be deterred by a double front tuck flip as you clear a 14′ gap? Or do you just need to leap and roll the gap? Or again, maybe a quadrupedal crawl across that fallen log bridge might be best. Success is a must, and looking cool comes from success. People who have never done parkour (or any other high-risk physical activity) tend to see only the sensational end results on youtube, and not the obsessive levels of meticulous and conservative training that underpin the visible final product. Safety is huge, but ultimately a part of “effective.” The speed and airborne moves you may have seen can be a part of parkour, but are far from necessary. Anyone can figure out a way to traverse an obstacle. Parkour is just a mindset to find your own best way through in each particular situation and moment. From one week to the next, you could be looking at the same obstacle. Your developing traceur’s eye (a traceur is somebody who practices parkour, by the way) will see different ways over or around it depending on conditions. Is it wet, dry, hot, dark, cold, sunny, etc.? These are conditions over which you have no control. Ignore them at your peril, but become familiar with them and you may find ways to turn them to your advantage. Conditions you CAN control relate to your mind and body: are you tired, fresh, fed, hungry, on or off balance, distracted, fit or out of shape? You can take care of these before training; you will likely not be able to control them if you are fleeing from bears, zombies, or the Pope (heckuva sprinter), so come prepared. Anything we do in life can be as easy or hard as we care to make it. Parkour just makes us realize it up front. Taking five or ten seconds to set and prepare for a standing jump is easy. Carefully climbing over a four-foot wall is easy. But when preparation time is taken away, the pressure to perform makes the same task much harder. Any traverse or passement rapidly becomes challenging when you have to do it at a dead sprint. The hardest and most beautiful thing about parkour and other challenging activities is that they unequivocally call shenanigans on us when no one else will. When you stand on top of a 6-foot wall and look down at the concrete or grass below, you can say whatever you like. “It’s easy!” “Man, that looks scary!” But that knot in the pit of your stomach will tell you what you really feel. Your mind will know whether you trained a hundred jumps and landings this past week, or whether you slacked off and played Xbox for three hours every day. If you trained up on your shorter jumps and landings, the knot will be smaller or not there. If you didn’t, the knot will be so large it’ll threaten to choke you with fear. Good parkour is fairly easy. Impressive, fast, and aggressive parkour is hard. If you want to perform YouTube or District B13 movie quality parkour, your typical time per passement goes from five seconds to half a second, which is a tenfoldincrease in difficulty. Your methods, movements, and relative safety considerations must all adapt when your time changes. Got it? Good! Let’s move onto some basic training on how to get started. After doubling the reps for each exercise (2×20), add another full set to your workout (3×20; you may have to temporarily reduce reps on that final set back down to 10 or less). When you can do 4×20, perform each rep a little faster, more explosively, to get in a more plyometric and aerobic workout. My own goal is a fairly arbitrary 5×20 because it’s a nice, round number. Once I achieve it for an exercise, I give myself the okay to tackle new and more difficult exercises. I’ve never seen anyone clear 7 steps. You got that down no problem? Awesome…now let’s do some fun stuff. New traceurs who can do three sets of 10 push-ups and pull-ups can work through Demon Drills’ Body category of videos. Try everything once slowly. Skip anything that’s too challenging, and come back to it in a week. Parkour is a highly personal form of self-expression and choice and it demands a fine sense of body awareness. Your body can only be as strong as it’s weakest muscle when it comes to Parkour, so make sure you are well balanced.